Boston was nothing like South Carolina. Up there, colored folks could go anywhere they wanted. Folks didn't wait for church to dress in their fancy clothes. Fancy was just life. Mama was a city girl . . . and now I was going to be one too. It's 1944, and in the small Southern tow... read full description below. Boston was nothing like South Carolina. Up there, colored folks could go anywhere they wanted. Folks didn't wait for church to dress in their fancy clothes. Fancy was just life. Mama was a city girl . . . and now I was going to be one too. It's 1944, and in the small Southern town of Alcolu, South Carolina, eleven-year-old Ella spends her days fishing and running wild with her cousins. But life is not always so sunny. Ella's mother lives far away in Boston, dreaming of being a jazz singer - and the simmering tension of a town divided by race is ever-present. Ella is therefore ecstatic when her mother invites her to visit. While in Boston Ella searches for evidence of the father she's never known, and also has her eyes opened to the possibility of a life she'd never dreamed of - one where African Americans can do as they please, and are respected. But her happiness is shattered when she returns home to the news that her classmate, George, has been arrested for the murder of two white girls. And nothing will ever be the same again. aryn Parsons is perhaps best known for her role as Will Smith's ditsy cousin Hilary Banks on NBC's The Fresh Prince of Bel-Air. After leaving acting behind, Karyn went on to found and produce Sweet Blackberry, an award-winning series of children's animated films, to share stories about unsung black heroes in history, featuring narration from stars such as Alfre Woodard, Queen Latifah and Chris Rock. The serie has been screened on HBO and Netflix, and is enjoyed by schools and libraries across the USA. 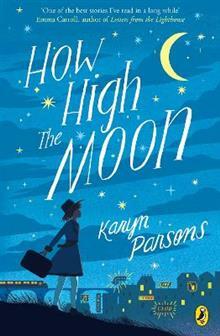 How High The Moon is Karyn's self-authored debut middle grade novel. She lives and works in New York.